Fiona Hyslop MSP, Cabinet Secretary for Culture and External Affairs has today welcomes Paisley’s bid to become the UK City of Culture 2021. Having met with representatives of Renfrewshire Council on 27th October to discuss the bid, Ms Hyslop believes that there is a strong case for a Scottish bid winning and Paisley with it rich tradition and heritage in music and textiles to name but a few areas, it would be a great host of the UK City of Culture in 2021. She went onto to say that we must learn from the bid Dundee submitted to host the 2017 UK City of Culture, ultimately losing out to Hull. These comment speaks to the partnership and sharing of experiences Paisley’s MSP George Adam is keen to see during Paisley’s bid. Speaking on the Cabinet Secretary’s comments, George said, “I was pleased to hear the Cabinet Secretary welcome Paisley’s bid and I’m sure she will be keen to work with our town, giving us the best opportunity to win this coveted prize. I attend both the launch of the Paisley 2021 bid in the Abbey 2 weeks ago and also attended a meeting held by Paisley First giving local business people the chance to be introduced to the Paisley 2021 bid. At the meeting, Project Director Jean Cameron spoke of her vision for Paisley 2021 and how we can all work together to achieve a winning bid and I hope to meet her again to discuss this further in the coming weeks. 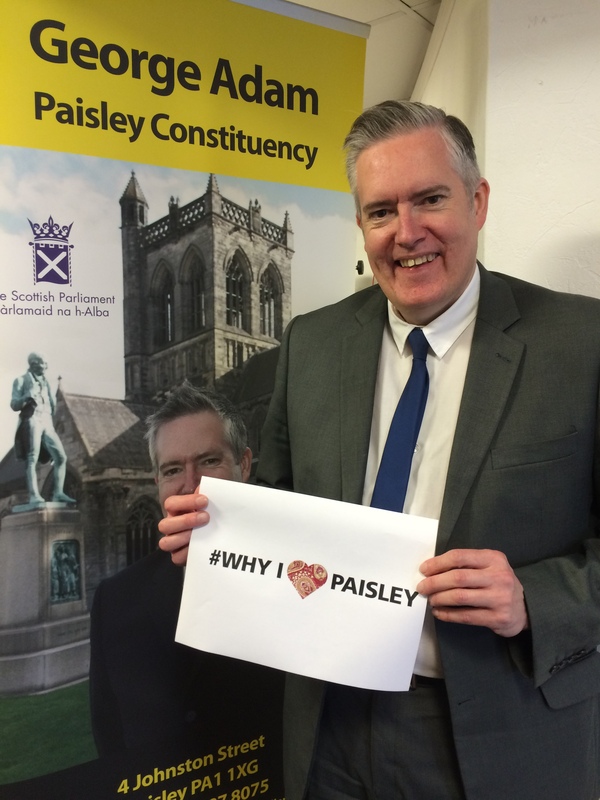 “Paisley has too much to offer in terms of culture. We have a wealth of world renowned musicians from our great town including Gerry Rafferty and Paolo Nutini. We have great actors hailing from our town including David Tennant and Carmen Pieraccini. From a creative stand point, we have Steven Moffat who currently writes both Sherlock and Dr Who television shows. And in art, we have John Byrne and Her Majesty’s Sculptor in Ordinary in Scotland, Sandy Stoddard to name but a few.